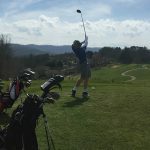 Polk County wrapped up its pre-spring break schedule on Thursday, taking third in a five-team Western Highlands Conference match at Reems Creek Golf Club in Weaverville. The Wolverines posted a team score of 379, with Avery taking top honors with a 352 and Mitchell following with a 363. Mountain Heritage finished fourth with a 393 and Madison had a team score of 462. Dillon Overholt led Polk County with a score of 88, finishing fourth overall. Hunter Lynch carded a 91, with Carson Emory posting a 95 and Nick Wilson recording a 105. Trey Thompson (107) and Blake Rackley (112) rounded out the scoring. Matt Leaman of Avery led all golfers with an 81.